Electrostatically charged mini-pleated furnace filter with a MERV 11 Rating. The Pleated Design significantly increases the surface area on which airborne particles can be trapped (as compared to Fiberglass Filters). Great filter for households with allergies. Electrostatically charged pleated furnace filter with a MERV 8 Rating. The Pleated Design significantly increases the surface area on which airborne particles can be trapped (as compared to Fiberglass Filters). Great filter for households with dust and pets. A healthy home begins with cleaner air. Improve the air quality in your house by reducing the amount of airborne allergens with a Filtrete Clean Living Dust Reduction Filter. This electrostatically-charged air cleaning filter attracts and captures large airborne allergens like household dust and lint, keeping the air in your home clean and pure. For maximum performance, replace your Filtrete Filter seasonally (every 90 days) to ensure you and your household are breathing cleaner air. A healthy home begins with cleaner air. Improve the air quality in your house by reducing the amount of airborne allergens with a Filtrete Healthy Living Elite Allergen Filter. Using electrostatic technology, this high-performance filter proactively captures dust, bacteria, germs, viruses and allergens from the air, and is five times better than non-electrostatic filters at capturing small particles. For maximum performance, replace your Filtrete Filter seasonally (every 90 days) to ensure you and your household are breathing cleaner air. 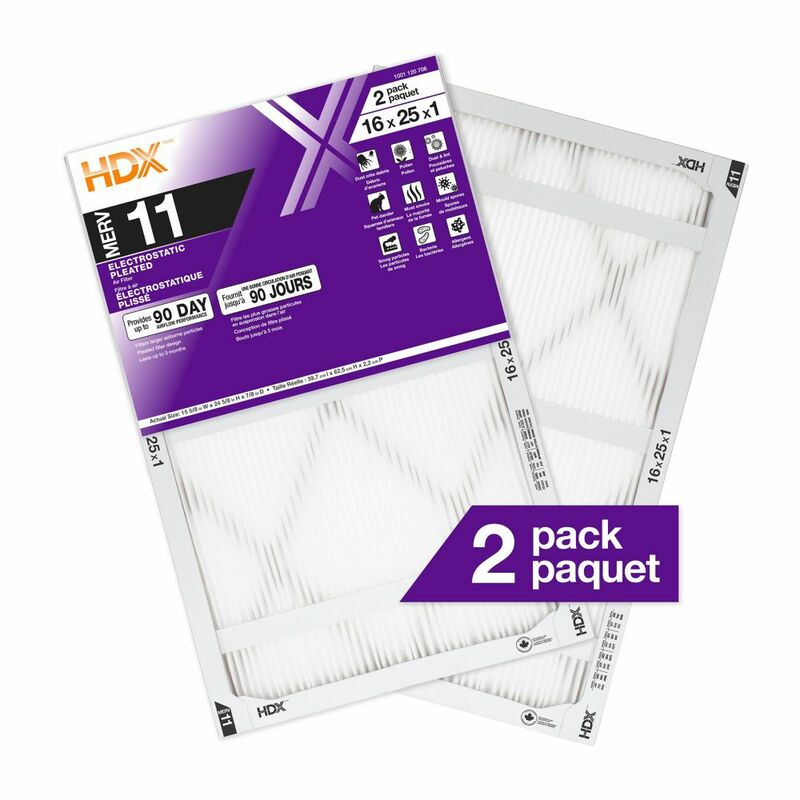 16-inch x 25-inch x 1-inch MERV 11 Furnace Filter (2-Pack) Electrostatically charged mini-pleated furnace filter with a MERV 11 Rating. The Pleated Design significantly increases the surface area on which airborne particles can be trapped (as compared to Fiberglass Filters). Great filter for households with allergies.